The first step for us to recycle OTR tires is to transport them from the mine site to our Northern Utah facility. We realize this is a large expense, but with customers in six states, our central location makes sense for now. We hope as our business grows we could open new locations near areas of large mining activity to reduce transportation costs. Once the tires arrive at our facility, the real work begins. By using very large, custom built equipment, we are able to reduce the tires into small rubber pieces that can be used in a variety of useful applications including, rubber mulch, ballistic rubber, asphalt rubber, rubber mats, and more. All of our process is mechanical and no heat or chemicals are used. Our process is very eco-friendly and does not emit any hazardous waste. 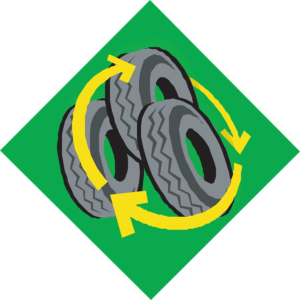 What are Tire Recycling and Used Tire Disposal Really All About?